A new year has begun! Well, Conmose started in 2016. But we will continue to write and grow in 2017! We're looking forward to year of awesome movies, series, comic cons and meeting lots of new people. So let us share our plans, thoughts and goals with you today! Oh, there are SO many conventions. I mean: really! So many. I don'even know what to choose. We live in Europe (the Netherlands) and comic cons here aren't as big (yet) as in the USA. But every year they are more conventions. And the existing ones become bigger and better! Let's discuss a few comic cons that will be held in our area in 2017. Oh for sure. I am so looking forward to our next convention year! Of course there will be the spring editions for both Dutch Comic Con (in Utrecht, the Netherlands) and FACTS (in Ghent, Belgium). But this year there will also be a spring edition of Weekend of Hell (in Oberhausen, Germany). 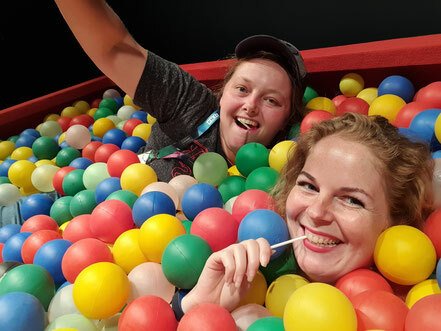 Last year we attended the first edition of Comic Con Amsterdam and they will be organizing their second edition this summer, but earlier this year there will also be a Comic Con Rotterdam. Of course KLZ Events will organize some great fan conventions in Brussels (Belgium). And then there are some great conventions in the western part of Germany and in The United Kingdom. Let's start with the one we already bought tickets for: Bloody Night Con (May 20th and 21st in Brussels). This is one of the great fan events organised by KLZ Events. (Have you read our interview with KLZ Events?) Bloody Night Con is a convention specifically about The Vampire Diaries and The Originals and they already announced some amazing guests. So Liv and I knew we definitely needed to go! We both watch The Vampire Diaries and we simply love it. Last year we attended ArcCon in Brussels. This Arrow/The Flash Fan Convention was also organised by KLZ Events. Because of this we already know what to expect from the KLZ Events and that makes this one great event to look forward to! There are still guests to be announced, but we already know a few names and they are spectacular: Ian Somerhalder (Damon), Claire Holt (Rebekah), Daniel Gillies (Elijah) and Nate Buzolic (Kol). Weekend of Hell had a big surprise when they announced that they will also do an April edition in 2017 (April 8th and 9th in Oberhausen). How great is that! Since they've already announced Seth Gilliam (The Walking Dead) and Linda Blair (The Exorcist) as a guest, we know for sure we want to go. Hell yeah, Weekend of Hell is so different from all the other conventions we attended. It focuses on guest from the Horror genre and we already met some great people at previous editions. At Weekend of Hell you really get the chance to interact with the actors. As Carola already said they announced Seth Gilliam for their April Edition and that is just great, we already met Seth at Dutch Comic Con last year and he was amazing. And that's not just because he is a great actor, but he is just so nice. I can't wait to meet him again! "The Exorcist" is one of my favorite horror movies, so it will be great to get a chance to meet Regan herself. These are the two we're sure about. But there will be many many more. We'lljust have to see which other ones we are going to choose from. Of course we love Dutch Comic Con, FACTS and Amsterdam Comic Con. And I've also seen some guest announcements for Comic Con Rotterdam. And there's also German Comic Con, Comic Con Germany, Walker Stalker Con London, Film and Comic Con London and many more. I just have no idea yet which ones I'll be able to attend. It will be a surprise :)! Of course we would love to be able to attend them all, but our time and especially our bank accounts are not limitless. Other than the money you spend at the convention itself, you also have to get there and more than often we have to sleep in a hotel. To end this part about comic con, I'll share the plan we have for 2017. We're hoping to attend a comic con further away from home. But we'll have to see if we will be able to get tickets.. We would love to go to New York Comic Con in October! That would be a dream come true! I'll keep you updated on our progress. Last week we talked about the movies of 2016. It was a great movie year. And I want to watch a lot of movies again in 2017! Older ones, but also new ones in the cinema. 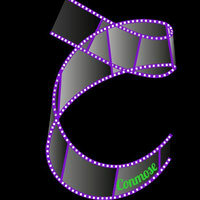 Let's talk about the cinema first. I'm really looking forward to the movie The Circle. It's a sci-fi thriller based on the novel of Dave Eggers (Also named the Circle). It will star Emma Watson and Tom Hanks. I've read the book and I loved it. It's all about Mae, who gets a job at a powerful tech company: the Circle. It's a huge an influential company with great ambitions. Mae loves it and is proud to be a part of it. The longer she works for the company, the more dilemma's arise. What about privacy, democracy, freedom an knowledge? How many influence should a company be able to have? I'm also looking forward to seeing Star Wars VIII of course :). 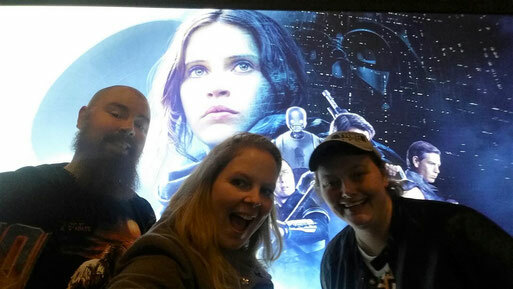 We watched Rogue One in December and we loved it. I'm a big Star Wars fan. Even though I'll have to wait until December for the next movie, I am already looking forward to it. And even though, I'm not a huge fan of the Fast and Furious movies, I think I'll watch Fast and Furious 8. If I'm not a huge fan, why do I already know I'll watch it? Two words. Jason. Statham. As some of you might know, I am a big fan of Jason. I watch every movie he plays in. And I own almost all of his movies on DVD. I also read about Wonder Woman and Justice League. I'm not sure yet, but I might watch them as well. And there will be much more. I'm sure of it. Which movies are you looking forward to? 2017 will also bring Fifty Shades Darker, Baywatch, the Mummy, Cars 3, Pitch Perfect 3, Smurfs: The Lost Village and much more. I'm not sure yet which movies I'll watch on DVD. It will depend on comic cons we'll attend (preparing) and which DVDs we will buy/ haven't seen yet of the movies we own. Sig and I both received some awesome DVDs for Christmas, so I'm sure we will watch those! You can always keep track of the movies we watched in our monthly post 'Movies we wachted in..' Same goes for me! I already talked about some of the movies I look forward to for 2017, in our previous post about the movies we watched in 2016. Of course I am also looking forward to the next episode in the Star Wars Saga: Episode VIII. I'm a huge Star Wars fan so I can't wait to see how the story continues. I'm looking forward to it even more, because of the tragic death of Carrie Fischer (Princess Leia) last week. This will be the last time we will see Fischer in this iconic role. Another movie I'm looking forward to is "Pirates of the Caribbean: Dead men tell no Tales". This 5th part in the "Pirates"-franchise is set to be released in May 2017. I love this franchise and Johnny Depp is just great in his role of Jack Sparrow. John Wick: Chapter 2 will be another movie I really want to see. I really liked the first one and I hope that this sequel will live up to the expectations. This is also the case for T2: Trainspotting. I think "Trainspotting" (1996) was simply wonderful and if this sequel comes even close to the first one it will be a must watch this year. - Beauty and the Beast; A live action adaptation of this classic fairy-tale. - Alien: Covenant; CAN'T WAIT FOR THIS ONE! The one movie I'm really excited about is Alien: Covenant. I'm a huge Alien fan and I really have high hopes for this one. I hate all the reboots and remakes Hollywood is pooping out. But this one seems great. I loved Prometheus and I'm real curious how they are going to link these stories together. Of course I can't wait for the new Star Wars movies either, the last 2 surprised me a lot, in a good way. I also like what I've seen of the new Trainspotting film. The first one is an absolute classic and it seems the second one will be good. As for the movie IT I only ask my self one thing: Why?!?!? Why do they have to remake this. The new Pennywise already looks god awful and I think I will avoid this one. I still have my doubts about the new Halloween, Friday 13th and Saw movie. I hope of course they will be any good. Also I'm playing to buy more DVD's and watch a lot movies I haven't seen before. I already ordered the first 3 this year haha. Yes! We do have some goals for Conmose in 2017 as well. We love what we are doing and we are really proud about all the things we accomplished in 2016. We met some great people, did some great collaborations, saw great movies, watched a lot of series and most of all we had a lot of fun! Ok, I am sitting here almost frothing at the mouth with jealousy over the fact that you're getting to meet Ian Somerhalder and Claire Holt! They are two of my favourites, I'd kill to see them in person! You're so, so lucky. Comic conventions aren't huge here in Australia yet, I hope I get to go to USA one day to see one of the big ones! They look amazing. Your enthusiasm is contagious. We are not fans of the same genre but I sure could appreciate your enthusiasm. One thing that I don't think is common here in our country are events like the ones you attend. So, it many ways, I am in awe of what it takes to attend one. It's not only the cost itself but also a lot of other things, such as scheduling. I think the celebrities understand this well, and if not, their agents make sure they do, so they will show up and make their fans (including you) happy and have a great time. While I am reading your post, I felt that blessings overflowed with you. From your words, I can say that you are very much inspired and will be willing to do what it takes to achieve the goals you have in mind. I salute you for loving what you are doing. It is one thing that gives more life to our existence. You have some ambitious goals for the year, and that's so exciting! I'm not a huge movie buff, but I look forward to seeing Beauty and the Beast, Wonder Woman, and Despicable Me 3. I can't wait to read those reviews when they do come out! I hope that you have a successful year for the second year as an active blog. I am sure that you all will have a great 2017 doing everything you can!